Watch this video to learn how ice dams form and how Alber Service Co., your local Dr. Energy Saver contractor, can help prevent them! 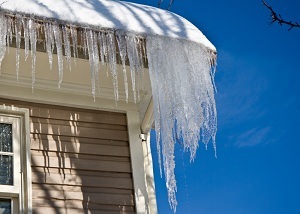 Frozen gutters and icicles hanging from your roof eaves are tell-tale signs of ice dams. An ice dam on your roof can cause damage to shingles, resulting in water leaks in your attic and damage to drywall, furniture, and flooring inside your home. While a roofing contractor can provide a temporary solution to your ice damming problem, Alber Service Co. can prevent future ice dams by sealing air leaks and improving the insulation in your attic. Call us at 1-855-241-3320 or click the button below to request your in-home energy audit and free estimate! We service Cherry Hill, Marlton, Mount Laurel and surrounding areas. Ice damming occurs when heat from inside your attic warms the underside of the roof and causes snow and ice on the roof to melt. When the water hits the cold overhang and gutters, it will refreeze and form an ice dam and icicles. 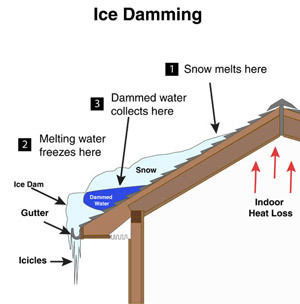 As the ice builds up a dam near the eave, melting water and rainwater will puddle behind the ice dam, and can leak underneath roof shingles and into your home. A water spot on your ceiling is a sign of a leaky roof. There are several factors that can lead to ice dams, including inadequate attic insulation, poor attic ventilation, and clogged gutters. Chipping away at the ice on your roof can cause damage to your shingles. The best solution for preventing ice dams and winter roof leaks is to properly air seal and insulate your home. These upgrades will pay for themselves in fuel and electricity savings, as well as provide you with a more comfortable, less drafty home. When snow on the roof is melted by heat escaping from the attic, and the melted snow re-freezes, this causes ice damming on the roof of your home. Eventually water can start leaking in, creating a ton of damage. Frozen gutters. We specialize in attic insulation and air sealing improvements that can help prevent ice dams and roof leaks. Ducts must be sealed to prevent leaks in an attic and insulated well to prevent heat loss (and heat gain in the summer). Your furnace may heat the air up to 100 degrees or more and send it through leaky sheet metal ducts through a 30 degree attic. It's inevitable that heat gets into the attic it's running through. This means you get less heat delivered to the room intended - so you have to run the furnace more to keep your home heated - and that costs you money. Attic vents are less necessary in an attic that is properly air sealed, insulated, and has it's ducts taken care of properly; however, the ducts will keep the roof deck very close to the outdoor temperature, since they don't have all the heat (and moisture) to vent out as they did before the home was "fixed." Air sealing should always be done before adding insulation. In addition to preventing ice dams in the winter, attic air sealing can help solve other issues like drafty rooms, uneven temperatures, and high heating or cooling bills. Sealing leaks will help your attic insulation perform like it should. By insulating without air sealing first, air leaks (such as around can lights, drywall to stud seams, pipe and wire holes, openings around chimneys and duct chases, etc.) that need to be sealed will be buried under a foot or more of insulation. We offer effective air sealing and a wide range of high-performance attic insulation options, including spray foam and blown-in insulation. Let us solve your ice dam & comfort problems at the same time! For an effective solution to your ice dam problem, contact the energy specialists at Alber Service Co. today to request an inspection and get a free estimate to upgrade your home insulation. We work in Blackwood, Sewell, Woodbury, Voorhees, Atco, Berlin, Williamstown and throughout the state. We can also conduct a home energy evaluation to pinpoint the problem areas in your home and provide you with a list of recommended improvements that can provide you with the greatest comfort and energy savings.